A dialogue and discussion for change between Vinay Gupta and D.V. Rogers. Disastr Hotel is a performance/installation based on your Hexayurt Shelter System that is a de-centralized design approach employing whole system thinking to the design of refuge camps and disaster response. Your open source Hexayurt model is a comprehensive family support unit that includes drinking water purification, composting toilets, fuel-efficient stoves and solar electric lighting. When did you start work on the Hexayurt Shelter System and why? There’s a thread running through world culture, about decentralization and individual autonomy. I got the bug from Gandhi, with his vision of little farming villages that make all they need scattered all over India. I could have got much the same vision of the future from Buckminster Fuller the engineer or even Thomas Jefferson, the American Founding Father. But I got it from Gandhi the saint. When I visited The Farm, Stephen Gaskin’s commune in Tennessee, I met Albert Bates and they showed me their domes and talked about manufacturing waste in the dome-making process, and I knew some of the relevant math, and it became a little project, to try and design the waste out of the geodesic dome. You talk about the theory of Diffusion and Innovation in how, why and what new ideas and technology spread through culture and discuss how your Hexayurt Shelter System is an ‘autonoumous building’ which is a nice concept, but in your view what do you mean by autonoumous buildings? The old vision, this common thread in Jefferson, Fuller, Gandhi and many others is about people being economically self-sufficient, and therefore “free” in some spiritual or political sense. The grid – exquisitely complex supply chains and trillions of dollars of power stations and cables and water pipes and storm drains and so on – requires a massive political bureaucracy to maintain. If you need that grid, you more or less need a government at this level of complexity and authority to maintain it. An autonomous building, in its simplest form, is a tipi or a yurt in nature. Heat comes from locally harvested wood, water from a stream, sanitation from an outhouse a safe distance from that stream and that’s your basic essential services right there. Then things get complicated – we want electrical light, we want flush toilets, we want higher population density and greater access to high tech services. Now there’s a tension between our desire for independence and autonomy, and our desire for stuff. Into that complex conflict comes conventional control politics because you need some kind of bureaucracy to manage the local sewer system and pretty soon you have a town council and a mandate you must have a lawn and two garden gnomes and submit proof of income to your tax authorities. All that comes from the architecture! The political control structures are living in our architecture! So autonomous buildings, at the most theoretical levels, are about re-internalising the political control structures by reclaiming the functions of a building from the power grid and water grid and road network and putting them back under our personal control. The autonomous building is autonomous from the infrastructure grid at a very practical level – it processes its own sewage, purifies its own water, harvests its own power from the wind and sun. But the benefit of this to society and to our fellows is that we cease to have to govern our neighbours in order to enjoy a toilet that works! Now scale this to a refugee camp. 100,000 people sharing a tiny patch of land with almost no money. If you go down the conventional approach and deploy efficient systems you will wind up with a central infrastructure for water and for sanitation and these will be maintained by a government or an NGO or the UN and the refugees will be dependent on this group for their lives and, worse, they will have no political control of how these vital services exist and are delivered. They are kept alive, but have no control of their lives. The infrastructure is much of the shape of a refugee society. Now imagine these refugees live in tiny autonomous buildings – small cabins that provide essential services, which can be moved. Now the camp can be split up into 2,000 small villages, each extended family group self-sufficient unto itself. No longer bound together by a well head and a toilet block, perhaps those who’s village is safe to return to can go back there at the first opportunity, taking shelter and infrastructure with them. Perhaps they can be resettled in small groups to other places with available land, rather than living anonymously in a gigantic slum. I have read how you presented the Hexayurt Shelter System model to the American Red Cross and the US Department of Defence – how did this go? Bluntly, the Department of Defence in the USA have been the strongest supporter of the Hexayurt Project and its goals. This is not surprising – the DoD has consistently supported decentralization in energy grids and in computer systems (witness the Internet which started its life there). They’ve been fascinated by the work of Amory Lovins and the Rocky Mountain Institute for 30 years, and I worked on their “Winning the Oil Endgame” book while I was at the Institute. They have a real cultural dislike of fragile, complex, interdependent systems and a deep cultural affinity for technologies like solar panels and the Internet. Simple, cheap, works-anywhere, no moving parts. The basic story of “so we just cut up some plywood and screw it together, and this gives us about twice as much shelter for a given amount of plywood as a square house?” went across pretty much instantly, because these are practical people. So every year there’s an exhibition of humanitarian technology at the Pentagon, right in the garden in the middle of the building, and they have tents and stoves and solar panels and water filters, and hexayurts. Nobody else does that, yet. The American Red Cross loved the hexayurt too. It went right into their arsenal of options for truly huge disasters. I did a rough plan for rehousing entire cities, using the autonomous building approach to cut the organizational complexity of providing for so many people down to something that could be done with mostly-volunteer labour, and I believe that this approach would get used if a whole city crisis occurred. There aren’t really any other credible plans for handing whole city events, I’ve been told. 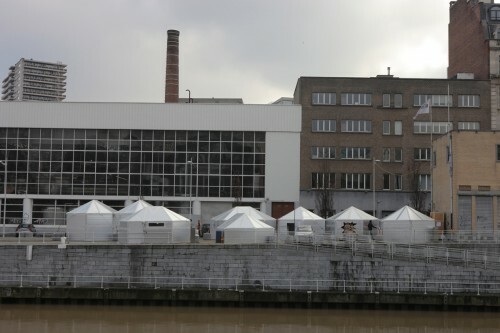 Considering the US Federal Emergency Management Agency (FEMA) shelter system is temporary accommodation for six, costing $40,000 (USD) and your Hexayurt Shelter System using general Home Depot supplies (the Bunnings Australia Equivalent) costs less than $1000, why is that these large federal agencies are reluctant to deploy your design in the field? Compared to a FEMA trailer, which has bedrooms and a little kitchen and so on, the hexayurt doesn’t even seem like it solves the same class of problems. But after a really big disaster, when 10% of the people displaced have totally filled the available trailers, and the hotels, and the stadiums and people are in the streets the hexayurt looks very different. Part of the rigorous simplicity, the insistence on using no complex materials – plywood and screws – is accepting that nobody will plan in advance to use hexayurts on a massive scale in the US context. So I’ve done what I can to make it easy for federal agencies to pick up and use the design after the event, if they are faced with a truly unprecedented disaster like a terrorist nuke or a civil war or a worst-case earthquake levelling LA. It’s designed to be adopted after the existing systems have failed, after the existing emergency systems have failed, after the last ditch systems have failed. In an American context, its what you do when there’s nothing else to do. You talk about a ‘Soft Development Path’ towards a tangible solution to global poverty and environmental degradation – where do you see the Hexayurt Shelter System fitting into the grand scheme of this concept? There’s two ways this might go. The first is the most likely path, in which the hexayurt is a band-aid for maybe a couple of hundred million people a decade, more or less exactly like tents, used by those in refugee camps, those in natural disasters, those in war zones, climate refugees. Use for a few years, move into something better. What has the real impact in that scenario is the hard push towards autonomous building and distributed infrastructure, and the political simplification which goes with this, enabling new options like partial continuous resettlement of refugee camps and taking disaster relief equipment and using it for development aid. The other option is that some consortium of people take the hexayurt further forwards and it turns into a “Linux of housing”: an ultra-low cost, factory manufactured integrated autonomous building system which doesn’t just replace the tent, but replaces the cinderblock-and-sheet-metal slum house and the mud hut and various other vernacular architectures. The cell phone has cut through all of that crap like a chainsaw. The poor saw something they wanted and they found the money to pay for it, which financed the infrastructure to supply it. If any of the stoves or toilets or solar cookers or low cost medical options or any of that stuff had actually done the job the poor wanted done at a price they found reasonable, they would have paid and built the infrastructure necessary to supply the service they wanted. So I’m confident that if the poor do not like hexayurts, they will reject them as soundly as they rejected all the other technologies that have not scaled. If the hexayurt winds up being everywhere, it will be because poor people like it, and for no other reason. The lesson of the cell phone is that the poor are in charge. Your background is in software development and it seems a natural fit to apply open intellectual property licenses towards the necessary technical and social solutions to disaster relief and development aid. Maybe this is why the Hexayurt Shelter System has not had much uptake with support from the US Federal Agencies, as there is NO money to be made from the corporate sector? Nobody supplying the government likes fair competition. But plenty of companies are printing money selling patent-free technology to government – roads and bridges and dams and printer paper and office chairs and so on. So at this point I think its really only a matter of time until some enterprising plywood manufacturing company or building contractor figures out that the hexayurt is a license to print money for them and that they can eat the lunch of the tent guys or the trailer guys and off they will go to the races. You don’t need a patent to make money in this world, and open source just leaves more on the table for the people actually delivering the service! In the long run it will probably be more profitable for whoever figures out how to push it through the government bureaucracy in the form of some kind of disaster service to the state. I guess corporate capitalist culture is yet to buy into decentralized infrastructure and autonomous buildings. Disaster and Aid relief is a touchy subject – for every dollar that is promised how much actually gets used on the ground where it is most needed? Heh. Right now, nearly all the wind and solar capacity in the world is sold by big corporations. Generally speaking, they do what we want them to, they move to where the money is. I like to think of corporations as mice the size of elephants, barging their way through our kitchens and living rooms looking for any scrap of energy, any crumb of money, that we are willing to give them. Gandhi showed us how to handle corporate colonialism – stop buying services from our oppressors. That was the core of his Swadeshi philosophy. Now, on aid… god help us. It’s not even about getting the money on to the ground, its a raft of political, legal and corporate problems which grow up around, frankly, the public throwing money at logos and never watching where the money goes after it’s been tossed into the charity bucket. The lack of pressure from the donor public for people to show results is why the aid game is full of organizations that are brilliant at fund raising and much less competent at delivering services. It’s our fault that the aid agencies aren’t sleek, hyper-competent, ruthlessly professional life saving machines – we give to the same old players because we trust the brands, trust that they have this covered, and then we allow ourselves to stop worrying about the poor because we gave money at the office and now somebody else worries on our behalf. And we don’t look back to see what happened next. How did the Hexayurt for Haiti project work out with Grass Roots United? Bit of a mixed bag, really. Haiti is about the worst mess in humanitarian terms ever – something like $10,000,000,000 (yes, ten billion!) was raised for humanitarian aid and reconstruction, and a year later nearly everybody whom the original earthquake displaced is still homeless, and the original tents and plastic sheet have rotted in the sun. On the other hand, the hexayurt we got built out there has not done so well – I saw pictures recently, and it’s very beaten up by the sun and the elements. It needed a coat of paint or two, and probably a better foundation. But one of the Grass Roots United staff members lives in it, and that’s basically our quality test right there. Staff are living in hexayurts in Haiti right now, and – thanks, open source – the next hexayurt will be painted and have a better floor and so on. We’ve always said the right thing to do is to build a couple of dozen hexayurts a year in disaster prone areas, improving the design, the choice of materials, the environmental fit until the design stabilizes at something people are genuinely happy with. Then when you have a disaster, build those. I’d still very much like to get a crack at Haiti. There’s a million people homeless still, with little progress on constructing even the very basic transitional shelters, and they’re at continued risk for hurricanes and so on. It’s a humanitarian crisis that has changed little since the months after the earthquake. But I wrote to everybody involved in Shelter Cluster in Haiti telling them about what Grass Roots United were up to, and nobody out of that group of 160 people from about a hundred different agencies followed up with us. I got two replies to that email, in fact. I’m not a field operations expert. I’m not going to build a charity to go there and build hexayurts in the field, competing with every other charity for the donor dollars and becoming one more player. What I’m hoping to do is give away the technologies that will make the existing players more effective. And it’s a straight binary choice, because if I were competing for donor dollars with existing charities, they would likely never adopt the technology. So we take slower progress now, in the hope of catalysing revolution later. It’s hard, but it’s the strategy I evolved based on Thomas Kuhn’s “Structure of Scientific Revolutions” and it’s served well so far in terms of negotiating with large bureaucracies and understanding patterns of adoption. The people who saw hexayurts in college will be the generation that puts them into the field is Kuhn’s basic message, and that seems to be right so far. Grass Roots United, Port Au Prince, Haiti, 2010. D.V. Rogers interest in designing, building and occupying ‘Disastr Hotel’ on the grounds of Sydney University as part of ‘The Right to the City’ exhibition is based around three ideas; 1. 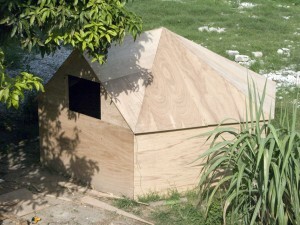 A demonstration of Vinay Gupta’s, Hexayurt Shelter System as a real world test and 2. A play on the idea that all disaster is imminent whether it be ecological, geological, or economic and 3. A performance of whole system thinking that demonstrates self-sustainable infrastructure that could be easily applied to everyday 21st century urbanization. ‘Disastr Hotel’ is not about destruction it is about survival in our somewhat fashionably precarious age. Shelter system design, water purification, low budget solar power, composting toilets, gasifer stoves and survival supplies lasting sixteen days. A de-centralized performance of DIY survival – ‘Disastr Hotel’ will be built from Bunnings hardware and visitors to ‘Disastr Hotel’ will be fed food rations supplied from the Coles supermarket reign. Unfortunately social movements are not strong enough or sufficiently mobilized to force through solutions of ecological sustainability and economic change. Individuals of action are yet to converge on the singular aim of gaining greater control of sustainable models for the new urbanization required in today’s technological, socially mediated age. ‘Disastr Hotel’ is the place you stay when you visit the future of today..